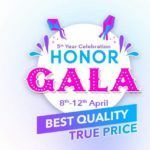 Honor is launching two interesting products in India today. The Huawei’s majorly online smartphone brand will launch the capable yet presumably affordable Honor 8C smartphone and, the Honor Band 4, a sleek wrist-wearable fitness, health and activity tracker. Honor had introduced the Honor Band 4 fitness band at an event held in China in September. It is currently being speculated that the fitness band could be launched alongside the Honor 8C in India today. The Honor Band 4 succeeds the Honor Band 3 and is a rival to the Xiaomi Mi Band 3. 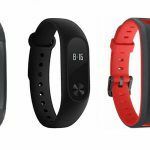 Xiaomi had launched the Mi Band 3 in India in September at INR 1,999. 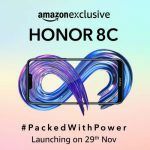 The Honor 8C will launch today, November 29 at 12PM, Incidentally, the Honor smartphone will sell exclusively on Amazon India. However, we expect the device may eventually sell on Honor’s official Indian e-commerce website HiHonor.in as well. Amazon has already setup a dedicated landing page for the Honor 8C. Similarly, the Honor Band 4 could launch at the same time. Moreover, we expect the Smart Fitness Tracker would sell exclusively on Amazon India as well. Incidentally, Honor posted a Tweet confirming the arrival of the Honor Band 4 in India, but it did not contain much information. But we do know that Honor Band 4 is the brand’s first Smart wearable device to feature a color OLED display. The Honor Band 4 should launch in India exclusively via Amazon.in, just like the Honor 8C. In China, the Honor Band 4 retails for CNY 199, which translates to approximately INR 2,000. However, we do not expect the fitness band to be nearly as affordable in India. Honor had launched the Honor Band 3 in India in July last year at INR 2,799. Since the Honor Band 4 offers several key upgrades over the Honor Band 3, it will likely be priced closer to the INR 3,000 mark. The fitness band is sold in three colors in China: Black, Blue, and Pink. The Honor Band 4 sports a 0.95-inch OLED display with a layer of 2.5D glass on top. Just like the Mi Band 3, the Honor Band 4 is water resistant up to 50 meters and also offers Swim stroke recognition. Some of its other functions include sleep tracking, exercise tracking, pedometer, continuous heart rate monitoring with Huawei TruSeen 2.0 technology, and sedentary reminder. 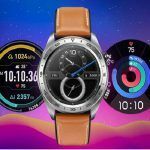 In addition to tracking your daily activity, the Honor Band 4 can also display notifications on its OLED display and even offers an incoming call mute function. The Honor Band 4 packs a 100mAh battery, which allows it to deliver standby time of up to 14 days. In comparison, the Xiaomi Mi Band 3 has a 110mAh battery and a standby time of up to 20 days. However, the Honor Band 4 comes with built-in NFC. This feature allows payments as well. Honor also sells the Band 4 Running Edition in China, which features a black and white POLED display and 20 days of standby time. The brand hasn’t confirmed if it will launch the Running Edition in India along with the standard Band 4. 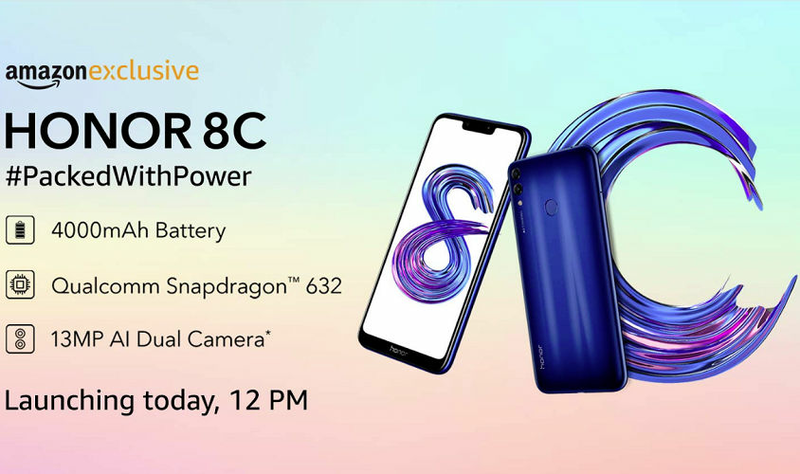 The Honor 8C, which was launched in China last month, will also be launched in India tomorrow. 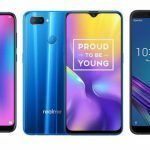 Honor’s latest budget Android smartphone is the first to run on Qualcomm’s Snapdragon 632 octa-core processor. Manufactured on a 14nm process, the Snapdragon 632 chipset feature four Kryo 250 Gold cores clocked at 1.8 GHz and four Kryo 250 Silver cores clocked at 1.8 GHz. Taking care of the graphics processing is an Adreno 506 GPU. Honor 8C sports a 6.26-inch notched display with 720 x 1520 HD+ resolution and a 19:9 aspect ratio. The smartphone comes with 4GB of RAM and up to 64GB of internal storage. In the camera department, Honor 8C sports a 13MP + 2MP dual-camera setup and an 8MP selfie camera on the front. Some of the other key features include a 4000mAh battery and a rear-mounted fingerprint sensor.